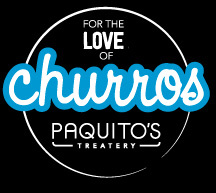 We provide a serviced counter and banner wall with a selection of traditional or filled churros or both. Look at our products to customise your serving. We will arrive with our van as a backdrop and set up a fully-serviced stall to provide you with your choice of our products that you will have selected. We supply a serviced bike with a range of our pre prepared filled Churros for smaller functions. Don Gustavo Francisco! Absolutely delicious. Our very own Churro Blinis!